Event #16: $10,000 Heads-Up No-Limit Hold'em Championship, began with 114 players. After 113 matches, only one emerged with an undefeated record. 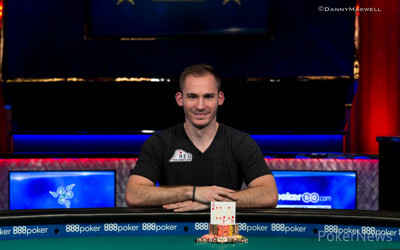 32-year-old Justin Bonomo outlasted the field, going 7-0 to capture his second World Series of Poker gold bracelet and the first-place prize of $185,965. Already on a record-setting pace for tournament winnings in a calendar year, Bonomo's live winnings in 2018 now stand at an incredible $14.5 million and it is only a week into June and the 2018 World Series of Poker. "I think I’m dreaming," said Bonomo. "I think that this is not real life and I think that’s the secret. Just win in your dreams because there you can actually win every tournament." Dreams or not, the reality is that Bonomo keeps on winning and the end isn't in sight. Let's recap his road to victory, shall we? With an odd bracket number of entries, the majority of the field was given half of their buy-in back and essentially played a $5,000 satellite in a "play-in" round. Bonomo drew fellow High Roller David Peters and told us after Day 2 that having to face against such a tough opponent, one that he is very familiar with, helped him to focus immediately. Bonomo scored the victory to earn a spot in the official bracket of 64 players where he faced off against David Laka. Bonomo flopped a pair with a flush draw, turned the flush, and Laka went all in after the river with just top pair. Bonomo called and won the match, earning a spot in the Round of 32. There he faced fellow High Roller Jake Schindler. A long match wasn't in the cards, though, as Bonomo decimated Schindler's stack on the first hand. Bonomo flopped a set, rivered a full house, and had his hefty river bet paid off before closing it out two hands later to lock up a seat in the Round of 16 the following day. Fellow bracelet winner Niall Farrell awaited him there, with the winner being guaranteed a min-cash. Despite it being early in the match with fairly even stacks, Farrell four-bet shoved for about 96 big blinds holding pocket threes and ran into Bonomo's pocket kings. No help came for Farrell, and Bonomo was the first to make the Round of 8. Mark McGovern was his opponent there and Bonomo held control for the majority of the match. With more than a 7:1 lead, Bonomo slightly trailed when the chips went in with ten-seven against McGovern's ace-six suited. McGovern flopped a flush draw to go along with his better hand, but Bonomo spiked a four-out turn to pull ahead. He maintained his lead through the river, and Bonomo was off to the semifinals the next day. Martijn Gerrits and Bonomo played a fantastic match in the semifinals — one that lasted 93 hands. It was a back-and-forth battle for a while until Gerrits scored a significant double to take a sizable lead. It expanded to as much as about 8:1 in Gerrits' favor, but Bonomo scored a series of double-ups to retake the lead and closed it out shortly thereafter. Now he had to wait for the other semifinals match to play out, and it only took 18 hands for Jason McConnon to defeat Juan Pardo Dominguez to set the championship match. McConnon held the lead after six hands, but after Bonomo seized it on Hand #7 he never relinquished it. He steadily chipped McConnon down until the chips went in on Hand #59. Down more than 7:1, McConnon committed his remaining chips with queen-nine and Bonomo looked him up with pocket fours. The pocket pair held and Bonomo won his second WSOP bracelet. "In the final match, I simply caught much hotter cards than I did in the semifinal match. I didn’t know who my opponent was before the start of the championship, but I looked him up online and he plays high stakes cash online. He’s just the type of guy that knows all the spots inside and out. Definitely not someone that you want to face in a heads-up tournament." Asked how it felt compared to his first bracelet, Bonomo gave an honest response. "The first bracelet definitely felt a lot more special. I had four second-place finishes at that time without a first-place finish. Now, I don’t really have to feel like I have to get any monkey off my back anymore or kill any kind of curse. The significance of this one just means that my insane winning streak isn’t over. I just hope it continues." There are no signs of Bonomo cooling off yet, and that's a scary thought for the rest of the poker community. That wraps up our coverage of the $10,000 Heads-Up No-Limit Hold'em event. Keep your browser locked to PokerNews.com through the duration of the World Series of Poker! Hand #59: McConnon raised to 150,000 from the button, Bonomo reraised all in with the covering stack from the big blind, and McConnon called all in for 781,000 with . Bonomo showed and it was off to the races. The flop came down , keeping Bonomo in the lead but giving McConnon a straight draw. The turn took away some outs from McConnon as Bonomo picked up a flush draw. The river completed the board, no help to McConnon, ending his run in the heads-up championship with a runner-up finish for $114,933. 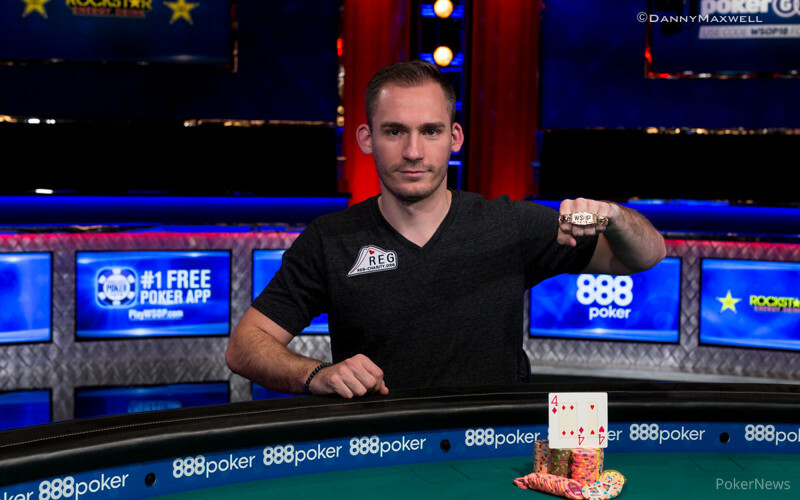 Justin Bonomo wins his second WSOP bracelet and the first-place prize of $185,965! A recap of Bonomo's path to victory will be posted later this evening. Hand #53: Jason McConnon folded and Justin Bonomo received a walk. Hand #54: Bonomo raised to 120,000 and McConnon folded. Hand #55: McConnon moved all in for 721,000 and Bonomo folded. Hand #56: Bonomo limped in and McConnon checked. The flop came and McConnon check-called a bet worth 60,000. After the turn both players checked to the river. No betting action took place and McConnon tabled the for top pair to win the pot. Hand #57: A walk for Bonomo. Hand #58: Justin Bonomo limped the button and Jason McConnon checked his option in the big blind. The flop came down and McConnon check-folded to Bonomo's bet of 60,000. Hand #51: Jason McConnon opened to 120,000 from the button, Justin Bonomo reraised all in from the big blind with a covering stack and McConnon folded. Hand #52: Bomomo limped his button and McConnon checked his option. The flop came down and McConnon checked to Bonomo who bet 60,000. McConnon check-raised 150,000, Bonomo called, and the turn fell. McConnon bet 250,000, Bonomo called, and the river completed the board. McConnon checked, Bonomo bet effectively 781,000, and McConnon folded. Hand #46: Justin Bonomo limped in and Jason McConnon checked his option. McConnon checked the flop and called a bet of 40,000 by Bonomo, the duo then checked the turn. The appeared on the river and McConnon overbet for 320,000 to force a fold from Bonomo. Hand #47: McConnon limped and Bonomo checked, the flop fell and Bonomo checked. McConnon bet 40,000 and Bonomo called, the appeared on the turn and Bonomo checked once more, as did McConnon this time. The river brought a bet of 120,000 by Bonomo and McConnon called. Bonomo showed and McConnon claimed the pot with for a pair of nines. Hand #48: Bonomo limped and McConnon checked. 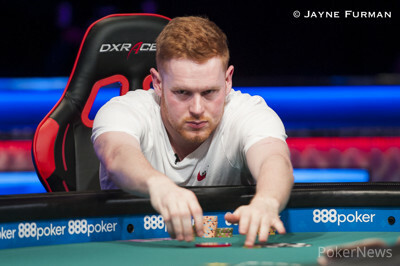 The flop was checked by McConnon, who subsequently called a bet of 40,000 by Bonomo. On the turn, both players opted to check and the river completed the board. No betting action took place and McConnon tabled the as the winning hand. Hand #49: McConnon limped, Bonomo checked and the flop came . The action went check, check, and the on the turn saw a bet of 40,000 by Bonomo, McConnon called. After the river, Bonomo bet 160,000 and McConnon folded after some consideration. Hand #50: A limp by Bonomo brought a check by McConnon and the flop resulted in a check by McConnon, a bet of 40,000 by Bonomo and a fold. 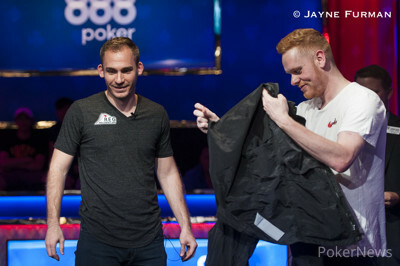 Hand #43: Jason McConnon raised to 80,000 from the button and Justin Bonomo called from the big blind. They checked down a board of board where Bonomo showed and McConnon tabled and they chopped it up. Hand #44: Bonomo opened to 85,000 from the button and McConnon called from the big blind. They checked to the river of a board where Bonomo bet 175,000. McConnon check-called. 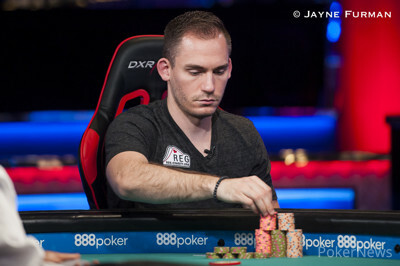 Bonomo showed for the board, but McConnon tabled for a queen-high straight to win the pot. Hand #45: McConnon opened to 85,000 from the button, Bonomo three-bet to 280,000 from the big blind and McConnon called. The flop came down , Bonomo continued for 180,000 and McConnon called. The turn was the , Bonomo bet 550,000 and McConnon called. The river completed the board, Bonomo bet effectively 1,136,000, and McConnon quickly folded. Who Will Win Event #16: $10,000 Heads-Up No-Limit Hold'em Championship?